On Tuesday, I went to Madison Square Garden to watch the Kentucky vs. Michigan St and the Duke vs. Kansas doubleheader games. My seats were basically right on the court, so I could view the game up close and personal, which was Great. Also, some of my friends texted me and said that they saw me on TV. I was extremely excited to watch the Duke and Kansas game. In the 2nd half, Kansas started to pull away but Duke went on a run to bring the game back close. Frank Jackson hit a 3 to tie the game, when there was like 8 seconds left. But then, Frank Mason of Kansas came down and hit a pull up at the buzzer to win the game. What an Awesome Game!!! On Wednesday, I had a workout with DJ Sackmann in Wycoff, NJ. Every workout with DJ we work off of a different move and use different finishes as well. So, in this workout, we worked on a double between the legs step back. On Thursday, this was an off day for me with basketball workouts or practice. I spent this time doing homework and studying for a big science chapter test on Friday. On Friday, I went to physical therapy. This is the first time I went to physical therapy in a couple weeks because of such a busy schedule. At therapy, my therapist Andrew, introduced me to a new machine in which, I worked on a lot of lower body exercises to strengthen my legs and core. On Saturday, I had a team practice in the morning. 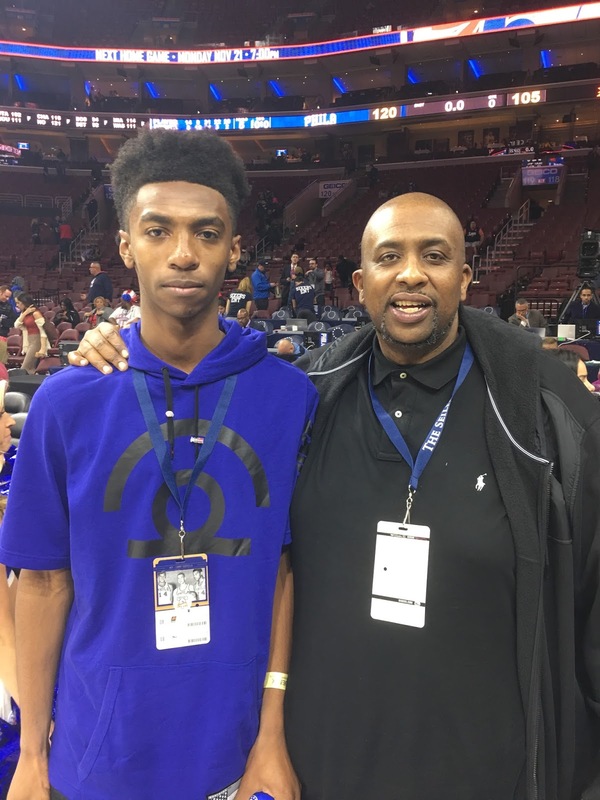 Later in the day, me and my dad went to the Philadelphia 76ers game. We had courtside seats, and having those seats to watch the game really made me look at it from a different perspective, because usually I’m watching it on TV, but today, I got the chance to experience it in person. Attending a live NBA game, was a great experience for me. On Sunday, I had a boot camp workout at Hoop Group with Mike Rice. 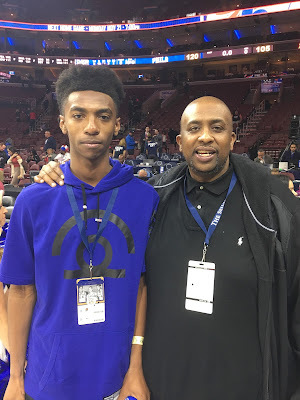 Before I wrap it up one last time, I just want to give a huge thanks to Mike Melton and the entire Basketball Spotlight staff for allowing me to express myself and share with you on a weekly basis a look into my life. I would also like to thank “My Family” for all your support and encouragement my entire life. My work isn’t done… I still have a long way to go and hopefully you guys will stayed tuned… I hope everyone has enjoyed my entries. For the last and final time, Trey Patterson signing off.